On April 21st 2006, I decided to go for liposuction on myself. Fat layer accumulated around my tummy area had reached a size of 48inches. I was weighing above 230Lb. With all dietary restrictions and exercises, my fat layer refused to decrease. We had tough time in finding suitable fit trousers, shirts or suits at the stores. One lady came for consultation for liposuction in March 2006. When I explained her that she should undergo liposuction in order to get rid of her stubborn fat layer and results are permanent, no untoward effects; promptly she pointed out to my figure, going out of proportions, that, why you do not get your liposuction done?? In an attempt to manage escape, very boldly I replied 'I do not get some one with enough experience to do it to myself'. She argued - You have your own team your own setup, there should not be any difficulty in getting your liposuction done, if you wish to get it done. I promised her to get it done, because she has given me the solution of my problem- "From where I should get my Liposuction done?". After doing her liposuction, I saw my work schedule, all appointments; and, I could keep an appointment for myself in my own hospital with my own team for 21st April 2006. Under spinal anesthesia, my liposuction was carried out by own team in my hospital, on Friday, 21st April 2006; I could see all operation being done on me, which I have been doing for last 20 years on countless patients. Light yellow fat running through the transparent suction tube to the attached bottle in the suction system, [no blood] was telling me 'Yes' now I am getting rid of my stored treasure of precious old gold calories [fat]. Believe me it was really wonderful feeling, I was relieved, not tense, but, every one else in operation theatre was. They were able to perform a wonderful job; after all I have shown my full faith, trust and confidence in them. They were tense [but not nervous!!] because like in any other case, objective was to deliver the best. Shortly after I was in patient's room, legs still not moving. After about 2 hour effect of spinal anesthesia disappeared and some restlessness was appreciated. I could feel what my patients feel and say, and I reassures them 'Nothing to worry, it will be Ok shortly'. Same was the case with me. In the evening I had light meal and decided to stay in room overnight. After a sound sleep next morning I had to attend my follow-up patients [no fresh appointments for Sat 22nd April 2006] which I could do without difficulty or show on my face [almost normal]. Next day, after removing pressure garment, I had bath/shower. Pressure garment was worn again. I knew, what I keep telling my patients, that this helps healing, reduce swelling and feel of pain is less. Scientific explanation to this is - the pressure garment obliterates the dead space formed after removal of fat cells, facilitates healing between superficial and deep layers, does not allow swelling to rise and since, it avoids rubbing of sore layer it actually prevents pain. Third post operative day i.e. Monday 24th April 2006 I was back to work, attended patients old and new in usual way without difficulty. Operations were performed on Tuesday and onwards routinely. All the time I wore pressure garment. It really helps. My wife, who has accumulated fat on many parts of her body, more so on face, looking chubby with lots of fat under the chin fanning out to cheeks, decided not to be left behind and avail benefits of Cosmetic surgery. I had to perform liposuction and few more lift procedures in the first week of May 2007, to make her look young. 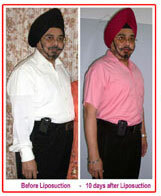 Now it is more than 10 months after both of us had liposuction, we feel very light, energetic, light and young. Now I measure 40" and has lost 46 lbs. I feel grateful to my patient who helped us making our mind. Looking into my experience of 20 years with patients coming for various cosmetic surgery procedures, fact which comes to fore is that most of us take quite long before taking a final decision to under go cosmetic surgery. Deep inside we understand that it is required, but, failing to accept the need on the pretext of some or other excuse, may be so called busy schedule or some other reason enough to pass the blame on someone else; we tend to let it be some other time. I can say, it is unfair with oneself own. There are few patients who understands the need, wants to undergo liposuction or other cosmetic surgery procedures, wants to know the experience of some one who had undergone similar experience. 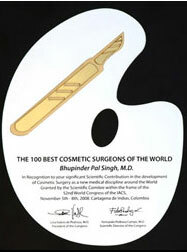 For me, as a Cosmetic surgeon, it is not possible to disclose identity of my esteem patient. I cannot encroach into the privacy of some one. Now, when we two have got liposuction and few more procedures done, we are available for any one who really wants to satisfy with the results or, may be, by asking us to clear their queries. This has helped me tremendously in gaining the confidence of patients. We must appreciate that whole day long throughout the life we keep working to fulfill the requirements, duties and obligations to our family, society, job or professional needs; do we take out time to look into our own needs. To keep ourselves in shape and figure, and to stay young is not only important but also helps in keeping an edge on others.